We have a new New FAQ/Knowledgebase available, please check it out! What makes a good Geograph? How do I get a Geograph point for my image? What is a Supplemental image? Do you accept multiple images per square? How do I find which squares need photographing? Why must I agree to allow commercial use of my image? What are my legal rights when taking photographs? I made a mistake on my submission, how do I change it? What an earth is a TPoint? I would be interested in re-using Geograph content, is that possible? I've seen little thumbs-up symbols around the site, what are they? I disagree with the location or title of an image - what can I do? I'm concerned about a photo or comment I have seen on the site. Counties, I'm confused, which do you display? What do all these strange words mean? There's a page I once saw on Geograph, and I can't find it again! Open source? Creative Commons? What's that all about? Who built this marvellous site? I use AOL, and the images look terrible! Many thumbnails seem to be missing, any idea of the cause? I have a further question, what should I do? See the original guide to good Geographing, contributors' quickstart guide, and the welcome letter. What makes a good Geograph image? Follow this link for a more in depth discussion of the finer points of moderation. Certainly - the points system is there to encourage people to make that extra effort to capture squares we don't have photos for yet, but we welcome additional Geograph or Supplemental images, perhaps showing a different subject, or a different time of year. You could be gaining yourself a personal point too. If you are looking for squares to obtain a point, try the coverage maps, and look for green squares; also accessible from that page are various printable checksheets for easy reference in print form. More technical users might enjoy GPX downloads. You can upload images of any dimensions, portrait or landscape, but the file size needs to be under 8 megabytes. We do resize them so their longest dimension is 640 pixels on the main photo page. Optionally, you can also release larger versions of various sizes for downloading and re-use. Larger Uploads Information. Our "Change Suggestions" allow any registered user to suggest a change of grid reference, title/comment or other information - simply view the full size image and click the "report a problem" link. Squares available for a recent photo are shown in orange on the Recent Only coverage map, or purple dots on the 'TPoint Availability' layer on the Draggable OS map. Well, if it's a 'geographism' - a term developed during use on this site, then see this glossary article we have started compiling. There is also a wide range of sites dealing with acronyms, and abbreviations, listed on DMOZ here . RSS, or Really Simple Syndication, allows you to obtain an up-to-date listing of the latest Geograph submissions for integration into another website or RSS reader. For more information, try this Wikipedia article on RSS . We provide an GeoRSS (RSS1.0) feed at https://www.geograph.ie/feed/recent.rss which contains links to the latest 20 moderated images. You will find an RSS button at the bottom of search results, useful to keep updated on local images. Registered users can access an RSS feed of the latest topics in the Discussion Forum, and even subscribe to an individual topic, just look for the RSS button! the Grid Square Discussions even supports GeoRSS. Get an RSS feed of recently updated Articles. The newer Content section has an RSS feed. Find out about organized meets by following the RSS feed. Simply click them if you like the image and/or description (separate icon for each). I would be interested in using Geograph content, is that possible? Please get in contact if you have an idea for re-using images, beyond what's available via the RSS feeds above. In all likelihood we can provide a feed to suit your requirements. The entire archive will be available for download via bittorrent - see http://torrents.geograph.org.uk for details. Find out about getting involved as a developer. 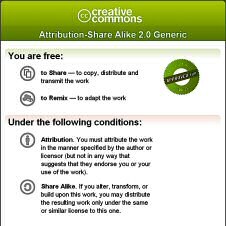 In addition, we require all submitters to adopt a Creative Commons Attribution-ShareAlike licence on their photographic submissions. While our volunteer photographers keep copyright on their photos, they also grant the use of their photographs in return for attribution (take a look at a typical submission for more details). Running this site costs money, particularly over time as the storage requirements are quite large. While we are confident we can meet those costs with sponsorship, granting commercial use allows anyone who runs the archive in the distant future to explore other options for generating funds, such as sales of montage posters. Granting everyone those same rights actually protects the site community from exploitation (see previous FAQ entry), but do bear in mind that we only retain a screen-quality version of your image, and that under the terms of the Creative Commons Licence, you must be credited for any use of your image. Please Contact Us, or drop in on our friendly Discussion Forum. AOL's default settings for graphics is to show "Compressed Graphics Only". This means AOL is selectively re-compressing images before you see them on your screen. This loses a lot of image quality. You should reset the preferences under "My AOL/Preferences/WWW" to display "Uncompressed Graphics". You will pay only a small penalty in download time to see this and other photo-oriented sites the way everyone else can see them. Some firewall programs, in particular Norton Internet Security, block images that are the same size as some common advertisements. Unfortunately many thumbnails and some map images happen to be this exact size. So if you use such a program you might like to try turning it off temporarily and trying again, and if that gets our images back, then have a look for the option to disable this, arguably, flawed method of security.